The biggest misconception about cycling today is that you are taking your life in your hands on our roads. I can see where that comes from. It mystifies me to see so many cyclists train along national routes where traffic is heaviest and risks are greatest. I certainly wouldn’t use them unless there was no other option. Of course these are usually racers and not casual cyclists like you or I. And we are heavily influenced by what we see the pros do and by what the bike industry wants us to do. More about that at another time. However we are blessed in our country with a massive network of minor roads that connect every village and lamp post in the country. When I cycle I usually cycle for 60 – 70 minutes. I take different routes every day and in good weather I cycle seven days. If I meet 3 or 4 cars on those routes it’s the limit!. I have the freedom of the road! You can too, with a little bit of planning. These routes are ideal for family cycles; they are all loops and are never more than 6 – 7 miles from home. That means I can cut back home if the weather turns foul or I have a mechanical problem. If I want to extend the loop I have options to go any distance and still be in touching distance of home. Not only are the roads safe but they are interesting as well; there are so many things to see, old ruins, significant historical buildings and interesting places, wonderful views, the natural flora and fauna, picnic areas and even places to swim! The bike really can be magic for young children and it’s all accessible from our front doors. Most Local Authorities are considering the needs of cyclists now. The provision of cycle lanes in our Towns is a welcome development which should encourage biking to school and work. Indeed a new bike lane is underway between Carlow and Kilkenny. Over time I will put up some route maps for anyone interested in getting out and about! The simple invention of the bicycle made a huge difference to society when the first versions appeared – coincidentally around the time the GAA was founded in 1884! It immediately took off. Where before people seldom travelled beyond the boundaries of their parish, ordinary folk were suddenly mobile. The bike flourished in the big industrial cities and suddenly towns began to expand outwards from the congested tenements of the inner cities to create suburbs.In rural areas people were now moving beyond their traditional stomping grounds and suddenly people began moving away from places associated with the family names for centuries. The world was suddenly a smaller place and a revolution was underway. Cycling was at first a means of getting to work and developed into a healthy pursuit of the working classes, while bike racing became hugely popular among the masses. Of course the bikes of the 1890s bear little resemblance to what we have available today and the comfort factor has increased exponentially. Thank God for that! In a world of few enough leisure activities the arrival of the bike provided ordinary people with a whole new way to spend their spare time. It opened up the country side to day trips and to even longer forays by the more adventurous. I can’t but recall the tale told by Peig Sayers of the ‘old hag’ who decided to venture forth to Dublin from Dun Chaoin. When she finally crested the bothrin over Sliabh an Iolar (Eagle Mountain) and saw the vast panorama ahead of her, she turned back home! 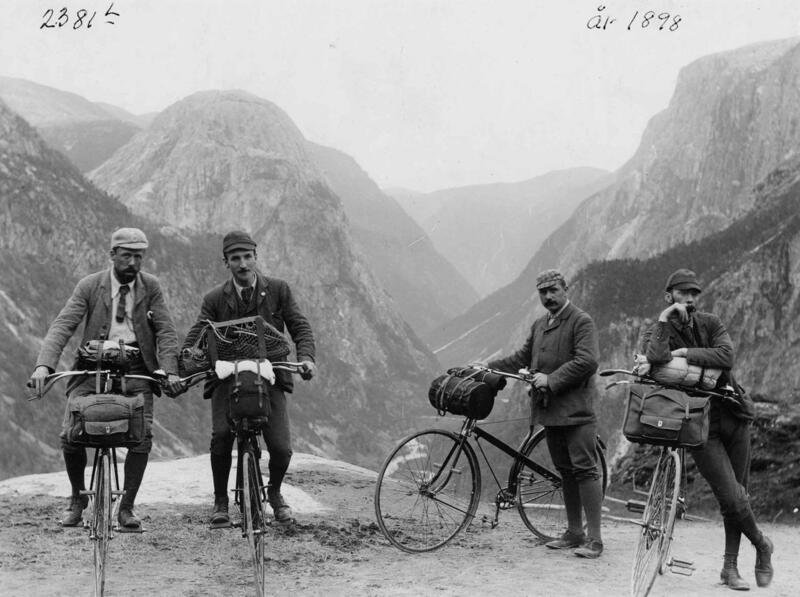 The bike certainly encouraged others to travel beyond their local hinterland. If the bike was the mode of transport of the working man, the arrival of the mass produced motor car changed the landscape even further and over time came to dominate our means of transport. So much so that in modern times the bike has been shunned by the majority as cars and big scary lorries trundled down inadequate roads. However once again there is a real shift in public affections and there is a massive growth in cycling both as a leisure pursuit and as a sport. We have been slower in this country to revert to our two wheeled friend but the bike to work scheme has accelerated our move back. It’s great to now see so many biking around our Towns and Counties even if most of it is my the sports enthusiast rather than the leisure cyclist. The bike certainly opened up the countryside once it began to be mass produced and now today we are all aware of the incredible biking feats of individuals who have truly found their freedom. Anyway, I hope my blogs will sow some seeds in my reader’s minds (all 2 of them). Buy a buy and recapture your freedom!